In a recent pandering interview for his new book, Bernard Kerik quipped "the worst time of his life...It's all behind me now". From personal experience I can attest the collateral damage of trusting and loving Bernard Kerik goes on...and on. Bernie, it's not over for Talia Ray or her sister, Ava. Sisters should never be denied the right to their relationship! To my sister Ava, Happy Birthday! I love you & miss you! 💛 from Talia Ray on Vimeo. Bernard Kerik, at the beginning of his book media blitz, opened with the headline and book excerpt that Rudy Giuliani broke the heart of Bernie's daughters, Celine and Angelina, when their God Father, Rudy Giuliani, refused to communicate with them after Bernie was busted for lies, tax evasion and corruption. 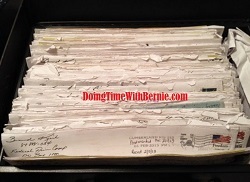 It was really a matter of trust between Rudy and Bernie, but that's another blog for another day. Well there are two more little girls, daughters, Talia and Ava Ray, caught in the wake of this tale. You won't read this in Bernie's "memoir". You see, Larry Ray, was once a great best friend, business partner and "brother" of Bernard Kerik. They professed love for each other in emails. Larry Ray was Bernard Kerik's best man at his wedding to Hala Kerik. Larry Ray even gave money to Bernie to pay for the wedding. Larry Ray, Bernard Kerik and Rudy Giuliani were associates back in the day. Larry's ex-wife in seeing to it Larry and Talia Ray never saw Ava again. And that's how it remains. Two little girls. Sweet innocent Sister. Separated with no visitation, for over a decade, reportedly partially due to the acts and intervention of revengeful and corrupt Bernard Kerik. I have a sister who I love like no other. The bond of sisters is unbreakable and powerful so separation is painful. Bernard Kerik takes delight in sending third-party strangers and evil interlopers to taunt, intimidate, harass and defame me and my sister (a stranger and innocent bystander to all of them) who is now too ill to defend herself. It is for my sister and all our sisters, I write this blog because sisters should be free to be together and share that love in a peaceful world. It should be that way for my sister and I. It should be that way for Talia Ray and Ava Ray. 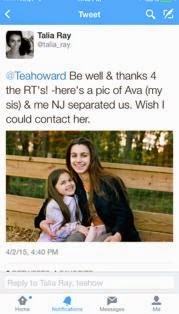 Bernard Kerik has the power to fix all of this, not only for his own daughters, but toward a Talia and Ava Ray reunification. Bernie has the power to repent, apologize, make amends and use his "notoriety" and media contacts to influence others to do the right thing. So far Bernie Kerik is only helping Bernie Kerik. It's overdue for a Talia and Ava family reunion. The family court should set it right. Right now! Bernie, it's time to walk your talk.